To listen to religious apologists you would think there is something special about humans that sets them apart from the rest of nature. More often than not, in addition to babbling about a 'soul' (although they don't seem to agree whether that's unique to humans or not) they will quote morality, ethics, love, compassion, and a sense of fair-play or justice as setting us about the mere beasts. This view has repeatedly been refuted by naturalists who can show that, for example, elephants grieve over lost friends and relatives, that several animals including the other apes show compassion and empathy. 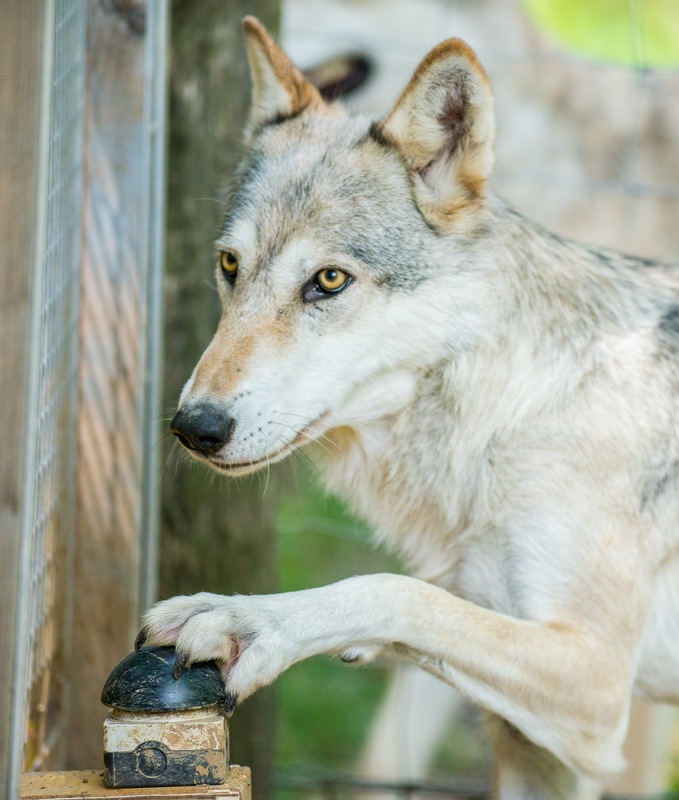 Now a paper by a team from the University of Veterinary Medicine, Vienna, Austria believe they have shown that not only domestic dogs but wolves have a sense of fairness and equity. Sensitivity to inequity is thought to be an important mechanism for recognizing undesirable cooperative partners and thus crucial for the evolution of human cooperation [ 1 ]. This link may not be unique to humans, as cooperative non-human primates also react to unequal outcomes [ 2 ], whereas non-cooperative species do not [ 3 ]. Although this hypothesis has not been tested in non-primate species, studies revealed that pet dogs show a limited form of inequity aversion, responding to reward, but not quality inequity [ 4–6 ]. It has been proposed that this primitive form of inequity aversion was selected for during domestication and thus absent in their ancestors, wolves. Alternatively, wolves, which hunt, raise pups, and defend their territory cooperatively, are similarly inequity averse as non-human primates, or at least to the same degree as pet dogs. Testing similarly raised and kept pack-living dogs and wolves, we found both to be inequity averse when their partner was being rewarded but they were not for performing the same action. Additionally, both wolves and dogs reacted to receiving a lower-quality reward than their partner. These results suggest that the inequity response found in pack-living dogs and wolves is comparable to that observed in non-human primates; results from studies on pet dogs may be confounded by the dogs’ relationship with humans. Consequently, our results suggest that inequity aversion was present already in the common—probably cooperative—ancestor of wolves and dogs and thus support the hypothesis of a close link of cooperation and inequity aversion. This basic instinct in humans is of course the basis of many legal systems including English Common Law - from which the laws of most American states are derived (the exception being that of Louisiana which is derived from French Law). The Law assumes an entitlement to equal and fair treatment in a trial, including the idea that what was good in an earlier case should be good in this one - hence the Law is the body of cases. As we say in English Law, the Law if the cases; the cases are the Law. Religious apologists have long argued that this this is what makes us 'civilised' and that the moral basis of this is God-given morals (conveniently ignoring the amoral, even immoral nature of their own god according to their holy books). What the researchers found was that, in experiments where of a pair of dogs completed a task but only one was given a reward, or one was given a lower value reward than the other, the dog treated less fairly refused to co-operate in future experiments. The same phenomenon was demonstrated in a captive wolf pack where the response was also affected by the individual wolf's ranking in the pack heirarchy, with high-ranking dogs reacting more quickly to inequity, presumably because they were less used to being treated unfavourably. Because a sense of equity is common to wolves and domestic dogs, it is strongly indicative that it was present in their common ancestor. So, where does this leave the notion that somehow human's are above the animals because they are conscious, have empathy and enjoy civilising morals handed down by an invisible law-giver? It leaves it in tatters, of course. There never was any basis for this anthropocentric arrogance. Morals and ethics are evolved characteristics in social animals where teamwork and cooperation are essential for success.